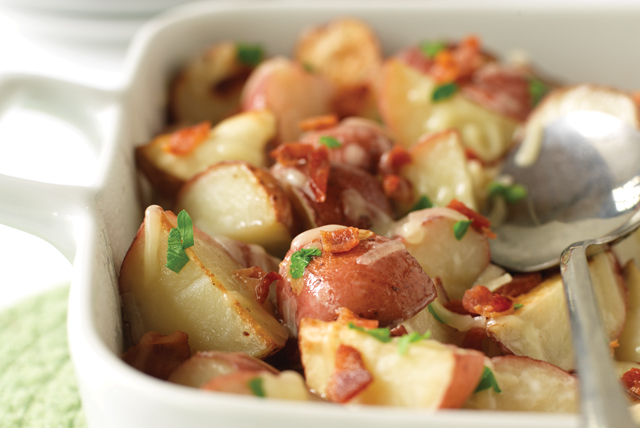 Take one bite of our Cheesy Baked Red Potatoes with Bacon and you'll be in spud heaven! Remain calm. Take another bite of your tasty baked red potatoes. Mix first 3 ingredients until blended. Add to potatoes in large bowl; mix lightly. Bake 55 min. or until potatoes are tender, uncovering after 40 min. Sprinkle with parsley. Prepare using 4 slices cooked and crumbled OSCAR MAYER Bacon. Prepare using KRAFT 2% Milk Shredded Colby & Monterey Jack Cheeses. Substitute chopped fresh rosemary for the parsley.